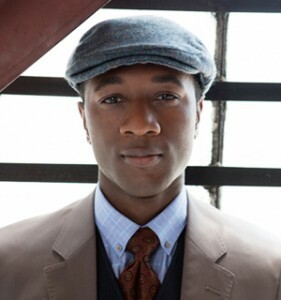 Acclaimed singer/songwriter Aloe Blacc has had a major breakthrough during the past 18 months. The pop/R&B artist co-wrote & sang the 2013 smash “Wake Me Up” by Avicii which was a worldwide #1 hit and remained in the Top 10 on the Billboard Hot 100 chart for a massive 21 weeks. “Wake Me Up” established Avicii as an international pop star, and introduced Blacc (who had previously released two indie albums) to a much larger audience. Then in early 2014, Blacc followed up with the release of his Lift Your Spirit album (on Interscope Records) which featured his hit single “The Man,” which reached #8 in the U.S., #1 in the U.K., and Top 10 in several other countries. The album also included his acoustic version of “Wake Me Up” and his latest single “Can You Do This,” which appears in the upcoming movie The Wedding Ringer (starring Kevin Hart and Kaley Cuoco). For Lift Your Spirit, Blacc collaborated with hit writer/producers Pharrell Williams, DJ Khalil, Theron Feemster and Rock Mafia. Notably, Blacc recently received a Grammy nomination when Lift Your Spirit was nominated for Best R&B Album. He has also released an updated version of this album called Lift Your Spirit: Higher, which contains three additional songs. Blacc was born in Southern California, and early on he learned to play trumpet and became a fan of hip-hop. He attended the University of Southern California (USC) and subsequently graduated with a Bachelor’s Degree. Interestingly, Blacc first worked as a business consultant and viewed his music career as a hobby. But when he was laid off from his job in 2003, he pursued his music career fulltime. It was in 2006 that Blacc signed with Los Angeles-based indie label Stones Throw Records, and released his debut album, Shine Through. Then in 2010 he released his second album Good Things, which included the single “I Need a Dollar,” which reached #2 on the U.K. chart and was Top 10 in other countries in Europe. Blacc became known in several countries overseas, and he furthered solidified his following by touring steadily. However, it was his collaboration with Avicii with truly established Blacc, particularly in the U.S.
We are pleased to do this new Q&A interview with Aloe Blacc. He talks about his early years, and how he met Avicii and co-wrote “Wake Me Up.” He also discusses his solo hit “The Man,” his album Lift Your Spirit, and his songwriting. DK: You’ve had such a great year with “Wake Me Up” and “The Man.” What’s it been like, to have this success and reach many new people with your music? Blacc: It’s been awesome…I never expected to have this success. Music was originally a hobby that I would do after working at my job (as a business consultant). When I got laid off in 2003, I had the opportunity to focus on music fulltime. I started recording with an indie label (Stones Throw Records). DK: You recently released a new version of your album (Lift Your Spirit: Higher) with additional songs. Can you tell me about the new songs? Blacc: The added songs are new to the U.S. public but were released on the German version of the album. These are songs which I felt would help complete the album I always envisioned for the U.S. version. There are 15 songs on the new edition. DK: “Wake Me Up” was such a breakthrough hit. How did you get together to work with Avicii? Blacc: Avicii was interested in working with a soul singer for his album. During an earlier session, Mike Chinoda (of Linkin Park) suggested he contact me. I went to the studio and we recorded a couple songs which didn’t make the album. But a few weeks later, Avicii was working with Mike Einziger (of Incubus) and he called me back for the session. I brought to the session the strongest lyrics I had at the time—I didn’t want to come to the studio empty-handed. They hadn’t recorded the track yet but they had the chord progressions. Mike Einziger played the guitar tracks. The lyrics for “Wake Me Up” reflected on how my life had changed so dramatically, from being a hobbyist to doing music as a career. I’d been traveling around the world performing…I thought my life was a dream. DK: I read an interview with Avicii, where he said you’re able to write lyrics quickly. Is writing lyrics your specialty? Blacc: I always have lyrics ready to go. I’ve been trained in hip-hop tradition and as a MC you’re always writing. I’m also always thinking melodically. DK: “The Man” was another great hit. What inspired you to write this song? Blacc: I’m a big fan of Bernie Taupin and Elton John. As a hip-hop artist I always thought of sampling “Your Song” and the line, “You can tell everybody.” Rather than purely sampling the original record, I decided I’d rather sing the part to allow me more flexibility [in performing this line]. DK: I like the message of your song “Here Today.” How did you write this song? which is featured in the new movie, The Wedding Ringer. Blacc: “Here Today” was a song inspired in part by a conversation I had with John Ehmann, who is my A&R exec at Interscope. He suggested that I try to write about bigger themes and stronger statements. I appreciate the way that John has been developing me and allowing me to grow as an artist. He treats me differently. With “Here Today,” I was writing about the music industry, and how so many artists don’t seem to think about the long term and the effects of their career. The lyric also reflects on the highs and lows of my own career. DK: In November (2014), you wrote an excellent editorial in Wired magazine about how the music streaming companies are not paying songwriters fairly. What steps need to happen to correct this situation? Blacc: The first step is to dramatically change the U.S. copyright law in regards to songwriters and music. Songwriters need to sit at the negotiating table (and reclaim their rights). If you’re an author, no one can just take your work and exploit it. As a filmmaker, nobody can use your film without permission. But this happens to songwriters due to the current laws. (The following passage is quoted from Blacc’s Wired article). By law, we have to let any business use our songs that asks, so long as they agree to pay a rate that, more often than not, was not set in a free market. We don’t have a choice. As such, we have no power to protect the value of the music we create. The abhorrently low rates songwriters are paid by streaming services—enabled by outdated federal regulations—are yet another indication our work is being devalued in today’s marketplace. DK: Are you optimistic that things can improve for songwriters? Blacc: I’m optimistic that this change can happen. My goal is to help increase the value of music, to incentivize the audience to pay for music again. I have an idea—to develop a TV show which would re-educate people about the value of music. This idea is in the works; I’m currently talking to TV producers about it. DK: What are your plans for 2015? Will you be releasing a new album or EP? Blacc: I’m thinking of releasing both an EP and album. The EP would be more acoustic. I’d love to do something with just guitar and just piano. I also want to release a fully-produced album next year.